SkinCeuticals products are designed to improve skin health through a simple philosophy: Prevent, Protect, Correct. At Mansfield Cosmetic Surgery Center Aesthetic Medical Spa, our aesthetician exclusively uses SkinCeuticals products for skin rejuvenation and antioxidant protection. Michele Fuentes, our licensed aesthetician has received advanced training in the complete SkinCeuticals product line and provides complimentary consultations. Contact our office and schedule a consultation for a skin analysis and to purchase products from our line of SkinCeuticals products. These SkinCeuticals products provide daily sun protection by blending high level sun protection with chemical-free UV filters. LIGHT MOISTURE UV DEFENSE SPF 50, ULTIMATE UV DEFENSE SPF 30, PHYSICAL FUSION UV DEFENSE SPF 50. These SkinCeuticals products provide high-concentration retinol cream (Vitamin A) available in two strengths to provide maximum efficacy to improve the appearance of fine lines, wrinkles, discoloration, skin texture, and blemishes. RETINOL 1.0, RETINOL 0.5. These SkinCeuticals products are formulated to provide hydration and nourishment to your skin to restore elasticity. DAILY MOISTURE, HYDRATING B5 GEL, EMOLLIENCE, RENEW OVERNIGHT DRY AND OILY. 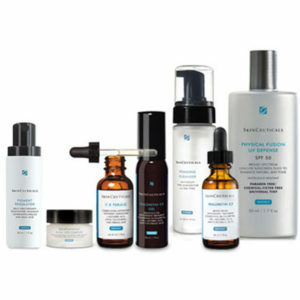 These SkinCeuticals regimes are comprehensive SkinCeuticals products combined in packages providing anti-aging and skin brightening systems. ANTI-AGING SKIN SYSTEM, BRIGHTENING SKIN SYSTEM.